There are several different types of stairs to choose from when it comes to the design of your staircase. Each of these staircase design options has advantages, disadvantages and a staircase 'atmosphere' if you like. 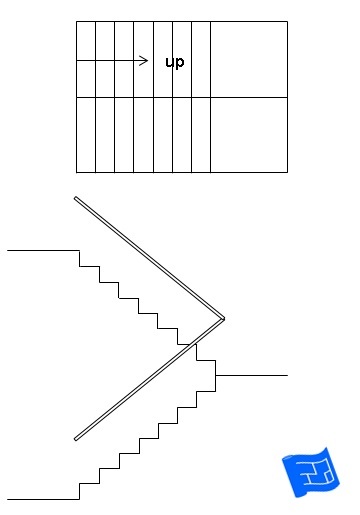 The different staircase design options have some peculiar names. 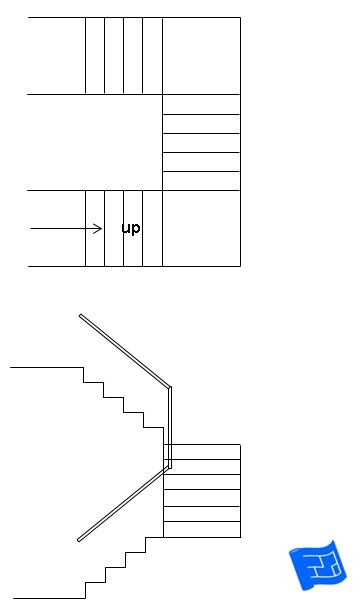 What's a winder switch staircase for example? We'll go through all the different staircase types one by one and have a little discussion as we go. 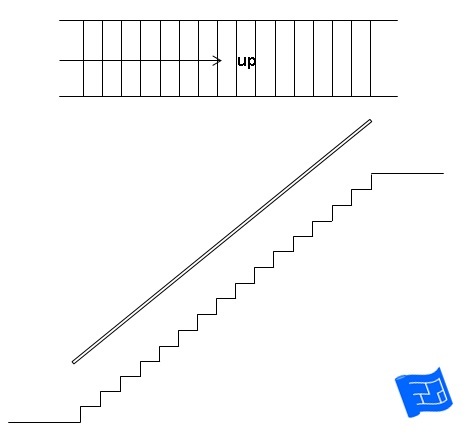 This is the most plain staircase with the flight of stairs is all in one direction. If your home is to have standard ceiling height, the chances are you could go and buy a straight run staircase from Home Depot. They're uncomplicated and inexpensive to build. If your home is to have several floors with straight run staircases stacked one on top of each other, there needs to be a return the length of the staircase to get from the top of one staircase to the bottom of the other. From a safety perspective there’s a nice regular rhythm which isn’t broken by landings or changes in direction, however there’s no landing half way to break a fall. I once went to look round a new build Georgian style house which had tall ceilings. We're probably talking 11ft or so. Of all the different types of stairs available the architect had gone for uninterrupted straight run staircases between all, wait for this, FIVE floors! 5! For me, this choice of staircase caused a few problems. It was a long way to walk from staircase to staircase because the run of the stairs was so much longer because of the high ceilings. If you were to take a tumble down these stairs, there's a long way to fall! The kitchen was located on the ground floor and the staircase going down to it felt like descending into the under world. As well a being a long staircase it was quite boxed in so it just felt a bit dark and ominous. And it's a staircase that would be used all the time getting to and from the kitchen. After all that, the architect did put in an elevator! 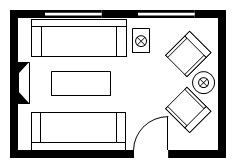 This is a very efficient and compact design. 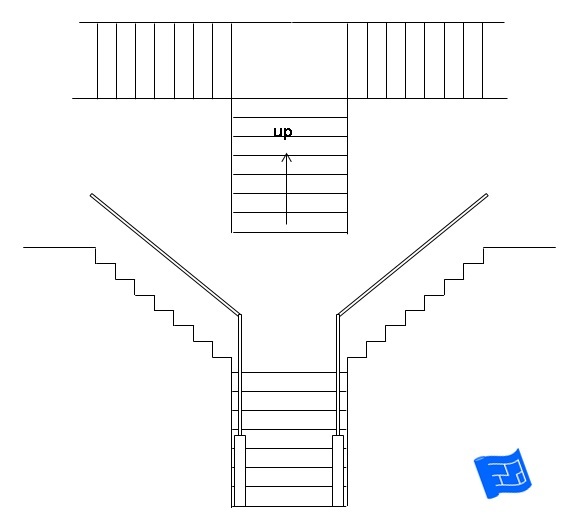 The stairs commence until a flat landing is reached and the direction of travel turns round 180 degrees to continue up the staircase. The landing in the middle of the staircase offers several design possibilities perhaps for a window, or an area to display objects or pictures, or install a seat. The landing contributes to the safety of this staircase, breaking any falls which happen above the landing. Note that the landing need not necessarily be half way up the stairs, although the half way configuration is the most space efficient design. 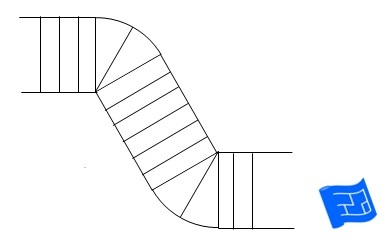 This is a variation on the scissor switch where instead of a flat landing half way up the stairs continue and wind round the 180 degree bend. This means the winder switch takes up even less of a horizontal footprint than the flat landing scissor switch. There is less opportunity for display or a seat because there is no flat surface landing. From a safety perspective, the change in direction is likely to break a fall, although probably in a less comfortable fashion than a flat landing. Winding stairs are less safe if two people meet on the stairs as one side of the stairs is narrow. Usually this configuration demands that one person stop and stands still while the other passes. 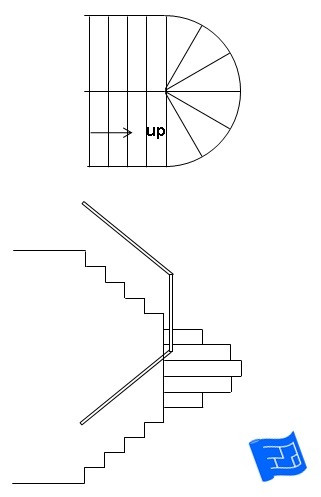 Another thing to note is that stairs that require a split (going into two directions) from a winding portion can only accommodate a winding portion of two steps. If you're facing a problem such as a space that won't accommodate the types of stairs you're considering, try adding a few winding stairs to the staircase design. Winding stairs at the top, in the middle or at the bottom can solve problems of space and direction and add interest to the staircase, making it more interesting to climb. 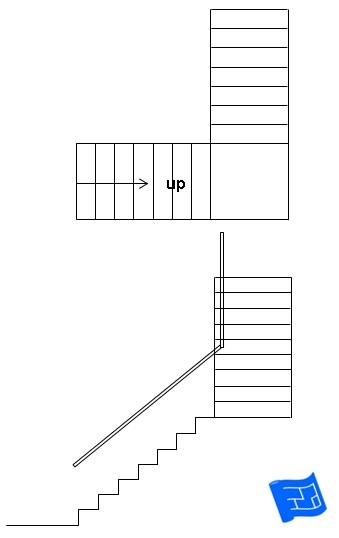 In some types of stairs a change in direction is included in the design. 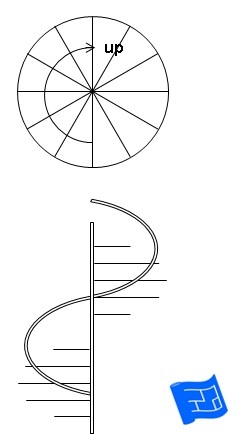 It needn’t necessarily be 90 degrees – other angles are of course possible. I have seen 90 degree turns used very effectively in two situations. Firstly, and by far the most common, it is used in slightly larger homes to create some double height space. Secondly, I have seen a 90 degree turn staircase used on the perimeter of a home, hugging the exterior wall around the rooms. Safety wise, the changes in direction creates a ‘fall break’, especially if there's a landing. The design comments above with respect to flat landings versus winder stairs apply in this case. These designs also create space around their inside turns which can be left to double height or perhaps used for an elevator installation. See scissor switch and winder switch for other relevant comments on design and safety. Here's a more unusual way of marrying winder stairs and different angles. Where does the fascination for the spiral staircase come from? If you want a spiral staircase as the main stairs in your home, make sure you plan for one big enough for two people to pass and for the furniture you need upstairs to be carried up (or you can make alternative arrangements to get furniture through a huge window, but by the stairs tends to be simpler). Spiral types of stairs are popular for getting up into the attic or onto a mezzanine floor, or perhaps moving from an exterior balcony down to garden level. The bottom of an enclosed spiral staircase is, of course, a spiral and can be a lovely feature in a home. Curved staircases are flexible and can be configured to turn through any angle 0 to 180 degrees. Large open height spaces can be created by incorporating long walkable landings as part of the staircase. Interesting layouts can be created using split staircases. There are times when a steeper flight of stairs is required. The most obvious solution to this is to shorten the treads and increase the height of the risers, moving from stairs, through a ships ladder configuration until eventually a ladder design is reached.